Although all workshops are flexible, the following themes have been used as starting points for past presentations. A * indicates possible connections to school curricula, and general age suggestions are given. 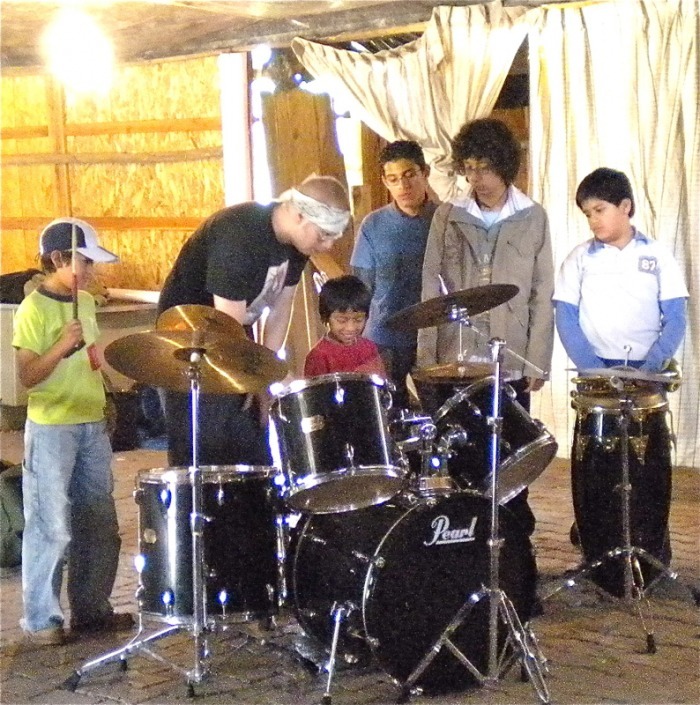 Children are introduced to the names, sounds, parts, and roles of the instruments in a jazz trio (e.g. trumpet / bass / drums). Using their entire bodies, children mimic the fun physicality of these instruments—from low crawling and fast tiptoeing bass lines, building up drumbeats with each hand and foot, and growing very tall or small through the entire range of the trumpet. 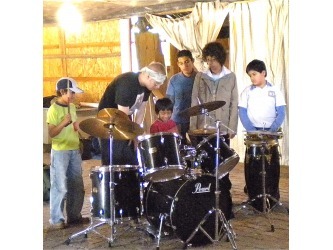 The trio’s sound and children’s movement perform songs together. Harmony (what fills up the middle): How do pianists and guitarists choose, organize, and express tones? How do bass players create melodies that support harmony and interact rhythmically? Rhythm (an underlying pulse): How do drummers and percussionists use “swing,”, vary the sound and color of their instruments, and use density and space to create a groove? Many other types of music draw upon a similar structure. Yet jazz is unique in that it relies upon improvisation (the spontaneous creation and development of sounds and silences) and interaction (unspoken cooperation of musicians within an ensemble). Through this carefully planned introduction including a variety of examples and demonstrations, students will come to understand the enormous breadth of individuality which continues to push the limits of this most vital art form. 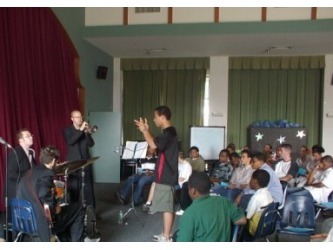 *The themes of this workshop are also applicable to the ways that a team, school, peer group or community function together as well, and the art of jazz structure can be used as a metaphor to introduce discussion of the former. Music and sound replace illustrations and children become the characters as interactive and imaginative musical performances accompany popular children’s stories (e.g. the Wild Things Are, The Lorax). Getting along is key to successful relationships in and out of school. But as we all know, just telling kids to “be nice” doesn’t make it so. By introducing the concept of a band as a team or group, a trio of performers will demonstrate that music always sounds better when we practice respect. While introducing the unique qualities of each instrumet—including hands on participation from the students—ensemble members will model the wrong and right way to treat others, and highlight some of the most common pitfalls of relational aggression. Behaviors such as exclusion, bossiness, and teasing will be playfully yet responsibly performed, discussed, and corrected through participation and musical motifs. Anticipation questions available pre-workshop. *The material presented in this workshop is easily related to morning meeting and social/emotional development. We all know that when 'that scary music' starts up, another frightful moment is lurking around the corner, and anytime the "Chariots of Fire" theme starts up we can't help but picture the present moment in dramatic slow-motion. How does music influence the context in which we understand film text, speech, and visual art? Composers and film-scorers have become increasingly more sophisticated in manipulating tone, mood, tension, emotion, drama, and irony by selecting and creating sound to influence their audience. This workshop take a look at several popular, dramatic films, as well as political speeches and literary text to examine the role of sound and music wthin a larger artistic context. Children become composers, constructing a multi-part song out of everyday emotions, actions, and objects. After choosing from illustrated cards, about five song pieces are attached to large board for children and musicians to see and ‘read’ together. 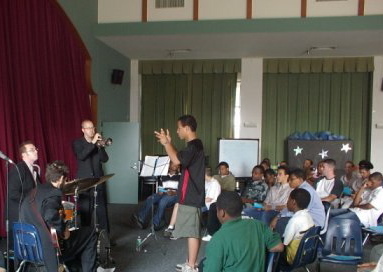 As the musicians perform these segments in a complete suite, children may choose to listen and/or act out their creation, followed by discussion. Children are presented with a large, mural sized poster of a blank musical staff. Each child is given a few cut out musical notes and symbols (markings for loud and soft, short and long, smooth and sharp, etc). After a brief explanation of terms, children are called one at a time to attach their notes to the group composition. The song is performed (what is missing and added are exaggerated) with each new event. As children are called again to attach their additional symbols, the teacher briefly explains how these marking make the song more interesting. Again, the song is performed with special attention paid to these details. Rather than being bogged down with the mechanics of the written language, children come away from this experience with a hands on, physical, visual, and aural understanding for the compositional process. This workshop—appropriate for musicians or non-musicians—introduces the compositional process and expands upon potential methods of “songwriting.” It also helps to bridge the gap between “developing creators” and performers. Non-musicians and beginning students are often intimidated by the enormous wealth of technical and theoretical material at the disposal of modern composers. Yet while the study of this material is important to a musician’s long term development, it need not stifle the initial creative impulses which can be cared for and cultivated even at a young an formally inexperienced stage. At its heart, composition is a process of assembling meaningful elements into a musical structure. With this in mind, students are encouraged to consider that the most effective musical text need not require an expert’s knowledge of rhythm, harmony, or orchestration. The building blocks for songs and improvisations are all around us, and when selected carefully are often richer in content and more approachable than more technical conventions. Armed with tangible suggestions from their box and gently guided by the lecturers, student groups build original compositional sketches. These pieces are performed by the musicians for the entire group, and are discussed and edited with the students. In addition to the box, students may be prompted by lecturers to offer their own suggestions in the form of memories, and impulses. Through interactive discussion, construction, and performance, students come away from the workshop with a broadened appreciation for the creative process and the satisfaction of having built and witnessed their won creative product. *The material presented in this workshop is easily related to literary arts and creative writing techniques. Many traditional songs from Asia are related to and reserved for specific parts of the day. Listen, as children become soft clouds, glittering stars, and as big as the whole night sky. West African rhythms depend on every group/person’s individual part, coming together to make a whole. 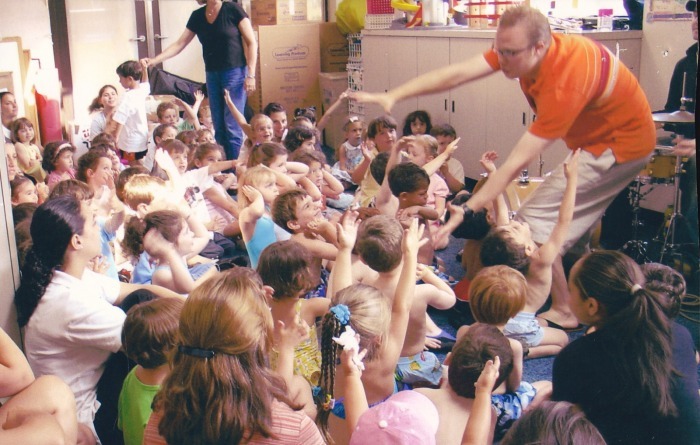 Using their feet, hands, and whole bodies, children’s movement becomes a rhythm. Pakistani ‘Qawwali’ (kah-WAH-lee) music teaches kids it is ok to NOT wait your turn! Surrounded by a group melody, children build confidence and creativity by ‘calling out’ their own solo parts. Question how American culture today threatens and/or promotes this art form. The discussion addresses the diverse musics of jazz icons Miles Davis and Ornette Coleman, up through contemporary progressives such as Alas No Axis and Bjork.